Let's see--we have boating, fishing, swimming, golfing--and what else? There's such a variety of things to keep you entertained while you're exploring the Pere Marquette River near Ludington in West Michigan! 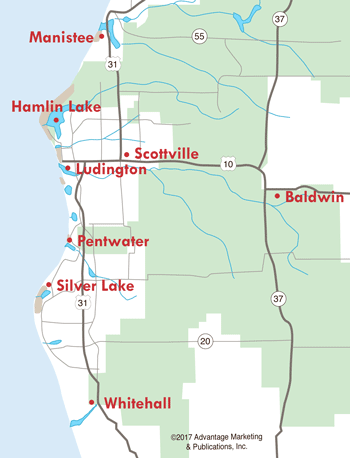 Tour a historic village or enjoy a thrilling dune ride at the Silver Lake Sand Dunes, or visit the popular Ludington State Park. Take the family out for a game of mini-golf, bowling, or catch a concert. You can't leave the area without visiting one of the spectacular lighthouses of the region, and just catching the sunset over Lake Michigan is worth the trip. View the S.S. Badger carferry as it sails into or out of Ludington, or hop on board yourself for the four-hour trip across the big lake. Boredom is never a problem along the Pere Marquette River in West Michigan!